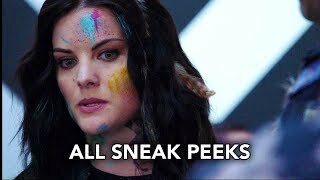 Following the emotionally-charged season finale, Blindspot returns for its fourth season. As we learned in the finale, Jane is being poisoned by ZIP, the very drug used to wipe her memory at the premiere of the series. Also suffering from the disease, her brother was searching for a cure and hid caches of data all over the globe. The team will follow a trail of cryptic breadcrumbs that lead to all-new crimes to solve and, with any luck, a cure to save Jane. Season four begins with Weller on the brink of death, Remi returned from the depths of Jane’s mind and Zapata working with the bad guys. Not knowing that Zapata has joined the villainous HCI Global, Reade tries desperately to find her. At the same time, Patterson hunts to cure Jane with Rich DotCom. Embracing last season’s global scope, season four starts with a daring heist in Tokyo, and action-packed missions will take the team all over Europe and South America.